* Inside jacket is polyester fleece that traps heat to keep you insulated. This windproof, thermal cycling jacket is the perfect apparel item to keep you riding throughout the fall and winter. This jacket is ideal as the top layer in the very cold weather. The fabric consists of three layers that keep you warm and dry. The top layer on the exterior is a rugged nylon windbreaker surface that is coated with a DWS (Durable Waterproof Surface) that beads up moisture and prevents stains. The second layer is sandwiched between the other two like a sandwich. It is a waterproof breathable membrane film which is laminated to a third layer a nice warm fleece. This cycling jacket is perfect for cold cycling. It also doubles as a casual jacket for outdoor activity. It has reflective piping built into the raglan sleeves for enhanced visibility at night. For built in visibility, there is reflective tubing that runs across the back and front but also adds a nice fashion detail. Whether you are riding your bike or just looking for a warm jacket to wear daily, this one will work perfect for you. It feels great, is trim fit and flattering to any physique. Cold Weather Bike Jacket. I LOVE this coat! Fits fantastic, great fit and finish and love the details. ONLY issue? The cuff liner should have been sewn in fully as my fingers will get caught in it putting the coat on. But...I'll live with it as it's a great jacket! Thank you! Super warm, great fit, love the look. I was very pleased with this jacket. It helped me bike through a Minnesota winter in comfort. Following someone else's suggestion, I purchased a 2X, which was perfect. The extra room allowed me to wear the appropriate layers underneath. This Aero softshell jacket is well made and fits my big shoulders and long arms. I wasn't sure I wanted to spend more money on a winter riding jacket, but a guy in our bike club was very fond of this one, so I sprang for it. -- I was not disappointed. It's now the jacket I wear anytime it is truly 'cold' or wintry out. --- I can put on 2 or 3 layers (thermal long-sleeve undershirt and biking thick-nylon pullover, plus a medium-weight fleece vest) and wear this jacket out on 25F days with 25 mph winds, and feel comfortable for hours. On days just above freezing, I don't need the vest and 2 layers underneath are sufficient. --- The jacket zips up snug and the elastic wrist-closures really help seal out the cold. I bought this jacket to give me protection from the damp cold Portland weather. It has actually exceeded my expectations. It is warm enough and blocks the wind such that with minimal base layering I can ride in weather with windchill to 20+ degrees. I usually base layer with a light merino wool long sleeve shirt. I add a light short sleeve shirt over that. Has been great for crossing the Columbia River on the I205 bridge on my commute to Camas. I received my Aero Tech soft shell cycling jacket, happy that I ordered the 2X size. Very happy with the fitting with a little room to spare if I had to add a fleece under the jacket. I am 6'3 235lbs. I just wore a long sleeved zip shirt underneath and I was warm while riding. Definitely cuts the cold while wearing this jacket. I am very impressed with the quality of the material. Happy with the outside chest pocket as well as the zip pockets on both. Fleece cuffs at the end of the arms cut any cold that might come up your sleeve. Yes I would recommend this coat highly and wasn't bad for the price either. I purchased the jacket in yellow for the visibility as I ride both roadside and trail. I've been looking for quite some time for a winter cycling jacket and finally found it!! A tad longer in the sleeves and body than my lighter jacket, which is perfect for cold weather. I'm 6', 230lbs but long waisted, and the 2X was perfect. Very comfortable collar when zipped up all the way at the start of the ride (then I can zip it down when I'm warmed up). Super warm, but breathable so I don't arrive home soaked. Well made (as is everything from Aerotech), nice pockets inside and out. Very reasonably prices as compared to the bigger name brands. I've become a HUGE Aerotech fan and hope they stay in business for a long, long time. I purchased the ATSoft-shell jacket several months ago primarily for cold weather riding. Although the weather was too warm for a fair test, that's no longer the case. I find the jacket + a merino wool shirt is perfect for riding when the outside temperature is between 30 - 40 deg. F. Below that, I add another layer, e.g., a sweater, and am quite comfortable. (I wish my hands stayed as warm!) One other thing: The jacket runs true to size, which has not been my experience with other brands. In short, I am as pleased with the AT soft-shell jacket as I am with their cycling shorts, of which I have several. I was very unsure about getting this jacket as it is my first time buying a bicycle specific winter jacket. I am very impressed at it's overall performance. I have no regrets getting it and the longer I have it the better I like it. This is my second of these jackets. The first one was a size larger. (Ride more, eat less - lose weight) As a person living on Social (in) Security I try to find the best "bang for the buck". Yes, I could find a winter jacket at a big mart store for a lot less. But would it be any good for cycling? Probably not. In those wise words from Benjamin Franklin, "The bitterness of poor quality remains long after the sweetness of low price is forgotten." Don't "cheap out" on winter cycling apparel. Get the good stuff. I have worn the Men's Softshell Cycling Jacket for several rides and walks since recently purchasing it. I live a little north of Boston right on the coast. It is very windy here nearly all the time. First ride was 42 degrees with just a thin long sleeve jersey and I was toasty. Then rode in 35 degrees, windy, with a fleece jersey which was overkill. Didn't need the fleece, even when I exceeded 30 mph. I used it for a walk at 28 degrees with one fleece layer under and it was great. I expect that below 20 will be no problem with a base layer and thermal jersey. It is not tight fitting, so it does catch a lot of air, but I like the overall design. Real zippered side pockets instead of rear pockets which I like. The red is visible without being garish. The sleeves are a bit long but that extra length works perfectly when on the hoods or drops. I would say that it qualifies as windproof. I haven't used it in the rain. For the price it's amazing. What a jacket for the price! Extremely warm. I wear a base layer and a long sleeve jersey with this coat and still break a sweat in 30 degree weather. I picked this jacket up on sale. Really, I wanted to support a firm that made at least some of its clothing in the U.S. I'm 6'2", 190lbs and I swam in the large. The medium fits great. Happy with the purchase for the price. That said, this jacket is not windproof. 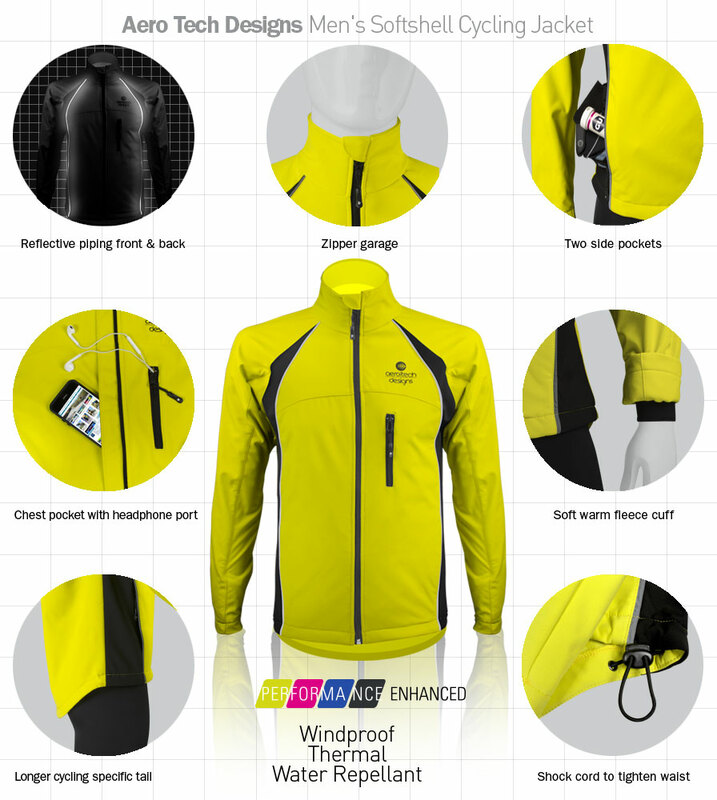 The material may be windproof but those are not the same statements. Higher end manufacturers like Marmot, Hi-Tec, Columbia, North Face, etc go through rigorous testing of seams, zippered openings, arm openings, etc before labeling anything wind or water proof. This jacket has some "draft" but it's still excellent for the price. I have ridden with the temperature in the high 30's and was fine with some additional items underneath. I bought this for my bike commute in Pennsylvania's cold winters and am thrilled. To date, I've used this jacket when the temp was around 29F with wind chills around 20F and the jacket kept me warm. In terms of fit, I am 6'0 and 175 pounds and got a large and it is perfect. When I first put it on, the sleeves seemed long but that extra fabric covers the "reach" when your hands are on the handlebars. Perfect! The tail and extra pockets are handy as well. The media pocket is on the small side. I like this so much I bought one for my dad for Christmas! This is a terrific jacket. It seems like a nice jacket, although there are sewing oddities that don't make much sense (what appears to be interior pockets have a giant hole in one corner? Weird juncture between jacket sleeve and cuff). Worse, though, according to the size chart, the XXL jacket should have fit with room to spare, but instead I couldn't even get it zipped. Even more unfortunately, Aero Tech charges MUCH more for the next size up (did you XS people pay less? I've always wondered that...). Anyway, sadly, I'll be returning it. The jacket looks good and seems very well made. It is very warm. I have worn it over a long sleeve jersey at 55 degrees and left it mostly unzipped and was still warm. I'm in central Fl and it will be more than enough for our coldest mornings. Everything I have from Aerotech has been excellent quality and this is no exception. Without removable sleeves this jacket is a no go. The only issue with the jacket is that the cell phone pocket is too small to fit a Samsung S7 phone which forces me to carry it in the pocket of the jacket. Make it BIGGER. Jacket is warm and windproof. I only wish it had a little better ventilation, such as a front zipper with two pulls so you could open the bottom up when things get too warm. The chest pocket is not big enough for a big phone, like a note 4 or iphone 6 plus. Other than that it is great. Kept me warm on a cooler day. Excellent wins blocker. Got this for riding in the bitter North Florida winter (i.e. 45 - 60Â°F) and have found it to be excellent. It keeps the wind out, it keeps the drizzle, light rain and fog out, and the pockets are quite sufficient. What I discovered through trial and error, however, was not to wear too many layers underneath it -- otherwise it becomes a sauna suit! After working out the right combination of garments, however, I can only praise it highly. It's well made, comfy, and the zipper is sturdy (unlike a lot of the cheap zippers that torment humanity). I ride/Race Handcycle's and I needed a warmer coat for winter Training and it works great so far the only thing its a little long but for able bodied cyclists im sure its great for them. I'm pretty much laid down in my Handcycle but it does the job of keeping me warm. Could use elastic on the inside of the sleeves to keep them more secure to keep the wind out. Excellent buy for the money. I've been looking for a cycling jacket like this for a while. I've been wearing the jacket for three weeks. The weather has been anywhere from 0 to 40Â° here. I rode in 0Â° weather today and only needed 2 layers of base to stay warm. It really blocks the wind and keeps me nice and warm. The inner fleece gets wet when I ride, and I have to turn the coat inside out overnight to dry the sleeves. In cold weather the side pockets are actually more convenient than back pockets. The only complaint that I have is that the phone pocket is very tight for my 6S iPhone.